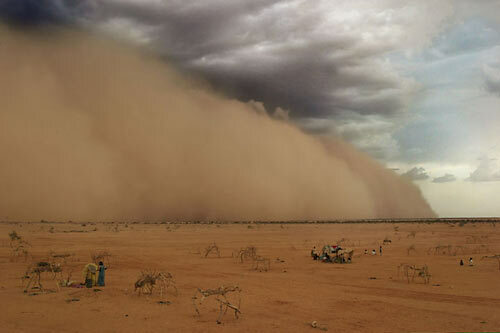 "A BOLT FROM THE GRAY"
"Nature's Wrath" Newly arriving refugees can do nothing but accept a massive sandstorm at the Ouri Cassoni refugee camp just outside Baha'i, Chad, in the NE part of the country. Of the estimated 187,816 Sudani refugees in Chad, roughly 16,771 reside in Ouri Cassoni. Since early 2003, the Arab-dominant Sudanese government, with help from local militias, has displaced almost 2 million Black Africans and killed nearly 75,000 more.